The product features an internal fault, where a high-resistance connection may form. There is a risk that the DC isolator may overheat and cause fire. Owners should immediately shut down the PV system following the standard shutdown procedure. Note that Advancetech Pty Ltd is now insolvent. If a consumer suspects they have one of the affected units, they should have an electrician inspect and replace the DC Isolators. 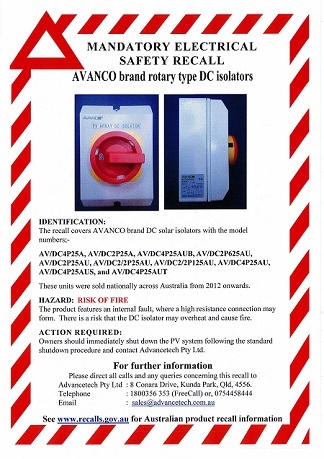 The DC isolators were sold by Advancetech via electrical wholesalers. The units were sold nationally from 2012 onwards.